Marie Benedict previously wrote The Other Einstein, which I thought was really well done. It was a “what-if” in the life of Albert Einstein, based upon his first wife and her influence on his life. Benedict came to the Lockport Library to speak about her book in October 2017. Her take on what could have happened in a person’s life intrigued me, so when I saw that she had a new book out, I had to read it. Carnegie’s Maid explores the life of Clara Kelly as she moves from her native Ireland to the United States. As she disembarks from her ship, she is mistaken for another woman with the same name. 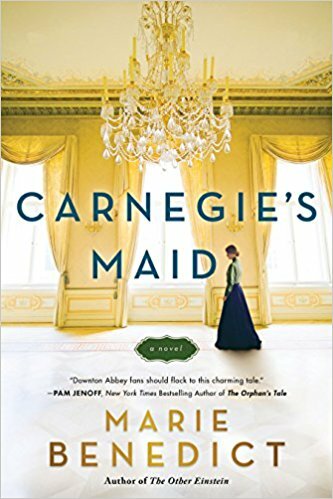 Assuming the identity of the other Clara Kelly, she finds herself hired on as the maid for Andrew Carnegie’s mother in Pittsburgh. This book explores the life of a maid in the latter part of the nineteenth century in the household of a wealthy family. It also takes a look at the life of Andrew Carnegie in his formative years as he was still amassing his vast fortune. Their relationship moves beyond simple employer and employee, but Clara must get away. Throughout the book, Clara acts kind of like a conscience to Carnegie. It is from this basis that Benedict forms the core idea of this novel. In 1868, Carnegie wrote a letter to himself stating that amassing untold wealth was “one of the worst species of idolatry.” He felt that it was incumbent upon the rich to use their money to improve society. Before his famous letter, Carnegie was more of a ruthless businessman than a philanthropist. What was the apparently drastic change of direction? Benedict uses this change to write an incredible story about what could have happened. This novel moves along in a steady pace. The research spent by Benedict for build Clara’s character was well done. She made Clara fit neatly into the life of Andrew Carnegie while maintaining the life of a young, woman immigrant from Ireland in a new home and country. That research continued into the building of Carnegie’s character for this novel. Underneath the hypothetical actions of the main relating to young Clara were the attributes that made him a leading industrialist in this country. so well known. Marie Benedict shows us again that her success with The Other Einstein is no fluke. Carnegie’s Maid is just as riveting and realistic as that earlier novel. I could not put it down once I started it. I cannot wait for the next installment in Marie Benedict’s novels. You should take a chance on this book. It’s worth the time. Craig Bacon loves a good book that is historically accurate and fun. This one definitely fits the bill.